Astrocytes are are the most abundant cell in the brain. They help to respond to injury and are important for maintaining overall brain health by supporting neurons, recycling neurotransmitters and regulating the formation and elimination of the connections between neurons. Astrocyte dysfunction is known to play a role in neurodegenerative diseases, but how astrocytes change throughout normal aging is not well known. One way to understand these changes is by looking at the transcription of genes in astrocytes. This week in PNAS, Clarke and colleagues performed RNA sequencing in mice at different stages of life to understand how astrocytes change over time. RNA sequencing was performed in mice at five time points between adolescence and old age, in three different brain areas: the cortex, hippocampus (involved in memory), and striatum (involved in movement and reward). They validated their findings using fluorescence in situ hybridization and quantitative polymerase chain reaction (qPCR) techniques (these techniques can confirm gene expression changes). To investigate whether the resident immune cells of the brain - microglia - play a role in inducing changes in astrocytes with aging, they compared astrocyte gene expression in mice with and without (knock-out mice) cytokines. 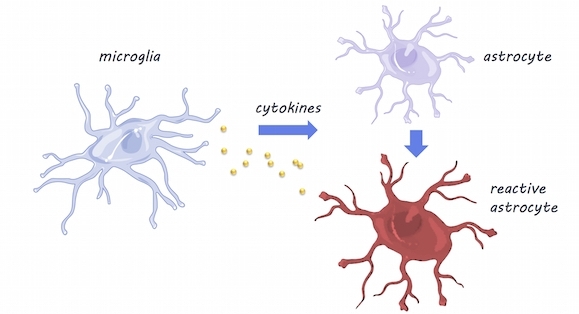 Cytokines are released by microglia in response to neuroinflammation. Using RNA sequencing, they found that as astrocytes age, they are more likely to express genes associated with reactivity (this is when astrocytes become dysfunctional -- typically associated with neuroinflammation). Astrocytes were especially likely to become reactive in the hippocampus and striatum, which are areas particularly susceptible to neurodegeneration in aging. Using qPCR, a method used to observe DNA sequences, they found that reactive gene expression was not increased in the knock-out mice without cytokines, indicating that microglia expression of cytokines may be partially responsible for changes in astrocyte gene expression. Aged brains also formed many more reactive astrocytes in response to the neuroinflammation inducer ‘lipopolysaccharide’, which may indicate vulnerability of the aged brain to disease and inflammation. This is the first study to demonstrate that astrocytes become reactive as they age and that microglia- the immune cells of the brain- may be responsible through cytokine activity. More reactive astrocytes were found in brain regions vulnerable to degeneration, suggesting that changes in astrocyte gene expression may help explain neurodegenerative diseases or cognitive decline in aging. Clarke et al., Normal aging induces A1-like astrocyte reactivity. (2018). Access the original scientific publication here. Copyright © 2017, BrainPost. All Rights Reserved.